Freshman year is very exciting. A few things I had to learn the hard way: you have to purchase your own Scantrons, pay extra attention to the parking lot signs, and not buy full-price textbooks. 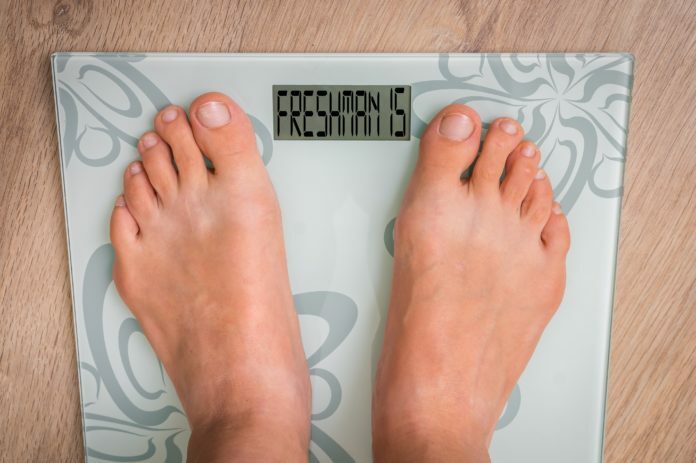 Oh, and watch out for the freshman 15. Disguised in cupcake wrappers, Coca-Cola cans and an inconsistent sleep schedule, the freshman 15 is among us. In high school we never had to worry about this; however, as freshman year continues and life goes on, our metabolisms begin to lag. Therefore, if you want to continue rocking those Hollister skinny jeans you got in eighth grade, I suggest following the three D’s: diet, discipline, and dormancy. said, it is vital to understand the nutritional value of what we are consuming. Consider substituting chips for a granola bar, a side salad instead of french fries, and frozen yogurt versus ice cream. Break your Dr. Pepper addiction with a healthier caffeine option like coffee. Keep a stock of healthy snacks for yourself–that way when you need something to munch on between lunch and dinner, you will not feel guilty for eating a banana over a bag of Takis. A healthy diet is the first step to avoiding the freshman 15 and maintaining a fit physique. Discipline: A consistent workout routine is just as important as a balanced meal plan. Luckily, TJC provides a state of the art work out facility that is free of charge and accessible to all students. The Ornelas Health & Physical Education Center is located on the east side of campus next to Wagstaff Gymnasium. The OHPE includes several weight rooms with machines and free weights, along with a cardio-respiratory room filled with treadmills, ellipticals, bikes, and rowers, as well as an indoor track that averages 10 laps to one mile. The OHPE also facilitates a swimming pool with specific times for recreational and lap swimming. Apps like Nike Training Club and 8fit provide free workouts and training plans that can accommodate anyone. Establishing a disciplined workout routine will help you dodge the freshman 15 and, most importantly, stay healthy. Dormancy: Sleep is the backbone to being healthy. According to the University of Georgia, “Sleep is important for a number of reasons. It restores our energy, fights off illness and fatigue by strengthening our immune system, helps us think more clearly and creatively, strengthens memory and produces a more positive mood and better performance throughout the day.” Sleep is the freshman 15’s biggest enemy. Without sleep, both a healthy diet and discipline are pointless. Doctors recommend getting an average of eight hours of rest a night. Whether that means studying late and sleeping in, or going to bed early and studying in the morning, getting some shut-eye is vital to your well being. With that being said, rest is best and combined with a balanced diet and fitness discipline. The freshman 15 will not stand a chance. I think this is a very interesting article to read. It is very important to know how to maintain a healthy lifestyle after high school. Life can become really busy trying to balance your classes and some students even have jobs they have to do as well. This article is super helpful for students that want to maintain that healthy lifestyle and also be successful in the classroom. I liked your main points on how to prevent the Freshman 15. However, I would like to know what the Freshman 15 is as you never gave a definition as to what it was.